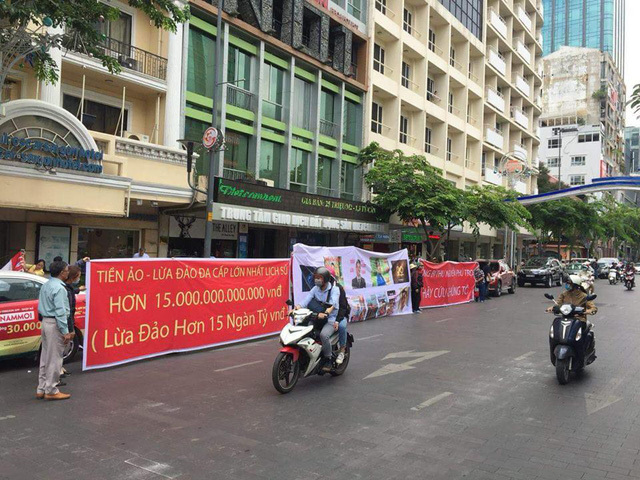 The investigation order was sent to the city’s police department by Le Thanh Liem, deputy chairman of the municipal administration, on Wednesday. Crytocurrency is a digital currency in which encryption techniques are used to regulate the generation of currency and verify the transfer of funds, all independent of a central bank. Liem asserted in his directive that cryptocurrency is an illegal non-cash payment method in Vietnam and the use of virtual money as a means of payment is prohibited. To ensure the safety and security of monetary activities, the municipal administration requested that relevant units streamline the inspection in order to promptly detect and address any legal violations that pose serious risks to businesses and individual investors. The directive was given less than a week after dozens of people gathered at the headquarters of Modern Tech JSC in District 1 on April 8 to publicly accuse the company of fraud. They say Modern Tech duped people into joining the ICO (Initial Coin Offering) for two cryptocurrencies, Ifan and Pincoin, in Vietnam. An ICO is an unregulated means by which funds are raised for a new cryptocurrency venture. Like an IPO (Initial Public Offering), companies can launch an ICO to crowd-fund the capital needed to launch new projects. In its Vietnam ICO, Modern Tech encouraged people to invest in Ifan, promising them a huge monthly interest rate of at least 48 percent, in cash. Ifan was advertised as a digital currency meant for buying music albums, concert tickets, and other products from local artists. Many top singers have alleged that their images were used in Ifan promotional campaigns without their consent. One must buy at least US$1,000 worth of Ifan to become an investor. Ifan investors were also told that the value of the tokens they received would skyrocket once they officially became crytocurrencies and that it would only take four months to recoup their investments. On top of these lucrative rewards, Modern Tech also pledged a commission of eight percent for referring investors. Over 32,000 investors wound up contributing a total of VND15 trillion ($660 million) to Modern Tech, only to see the company abruptly switch from making interest payments in Ifan rather than cash, as promised. While Ifan’s value plummeted to about one U.S. cent per unit, Modern Tech set its value at $5 per coin on its system. Investors were also unable to withdraw their investment for cash. Modern Tech JSC has a total of eight shareholders, with Vu Huu Loi from the northern province of Tuyen Quang holding the biggest stake at 15 percent. The second biggest shareholder is Ho Xuan Van, who owns 13 percent of the company and also serves as its legal representative. Many of the eight shareholders are known for engaging in multilevel marketing activities in Vietnam. Unsurprisingly, they live up to their modus operandi. According to experts, the Ifan ICO is in fact a pyramid scheme, where older investors are paid using revenue generated by new investors. Also on Wednesday, Prime Minister Nguyen Xuan Phuc issued a directive, requesting that the State Bank of Vietnam, the Ministry of Public Security, and other bodies tighten their management of activities related to bitcoin and other cryptocurrencies. Cryptocurrency investment and trading as well as raising money through ICOs are evolving into a complicated area, according to the document posted on the government’s website. “These developments threaten to affect the stability of the financial system, social order, and safety and pose great risks to corporate and individual participants,” the directive reads.